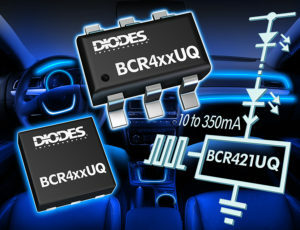 Diodes Incorporated, a leading global manufacturer and supplier of high-quality application-specific standard products within the broad discrete, logic, analog and mixed-signal semiconductor markets,extends its family of automotive LED drivers with the BCR4xxUQ series that simplifies the driving of low-power lighting. LED technology is displacing conventional bulbs throughout the car: from external lighting such as side markers, puddle lighting and sill plates, to internal lighting including dome, ambient lights, instrument clusters and button backlighting. The BCR4xxUQ series is designed to meet the needs of all these applications, providing a simple, low profile, flexible approach to driving low-power LED strings. 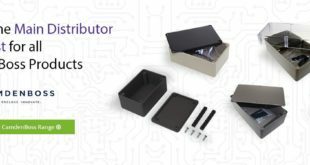 Each of the devices in the BCR4xxUQ series can provide a pre-set current output without the need for any external components, or deliver an adjustable constant current between 10mA and 100mA (BCR401UQ, BCR402UQ, BCR405UQ), 200mA (BCR420UQ), or 350mA (BCR421UQ)with ±10 per cent tolerance. All devices in the series are available in both industry-standard SOT26 and low-profile DFN2020 package options. 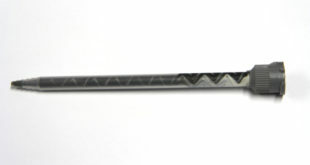 The thinner 0.6mm DFN2020 is designed for edge-lighting applications in which a less intrusive, lower-height package is required. All devices include negative temperature coefficient, which lowers the LED driver current as the internal temperature rises, thereby protecting and extending the lifetime of the LEDs. In addition, the linear topology used means the devices exhibit virtually no EMI. With a wide operating voltage range of between 1.4V and 40V and total power dissipation of up to 1.7W, the devices can be used to drive larger strings of LEDs while still providing sufficient protection from transients in a 12V automotive supply system. 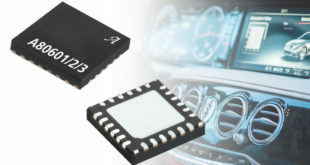 The BCR421UQ has the advantage that it can be PWM dimmed directly from 3.3V MCU signal with up to 25kHz and a duty cycle of one per cent. 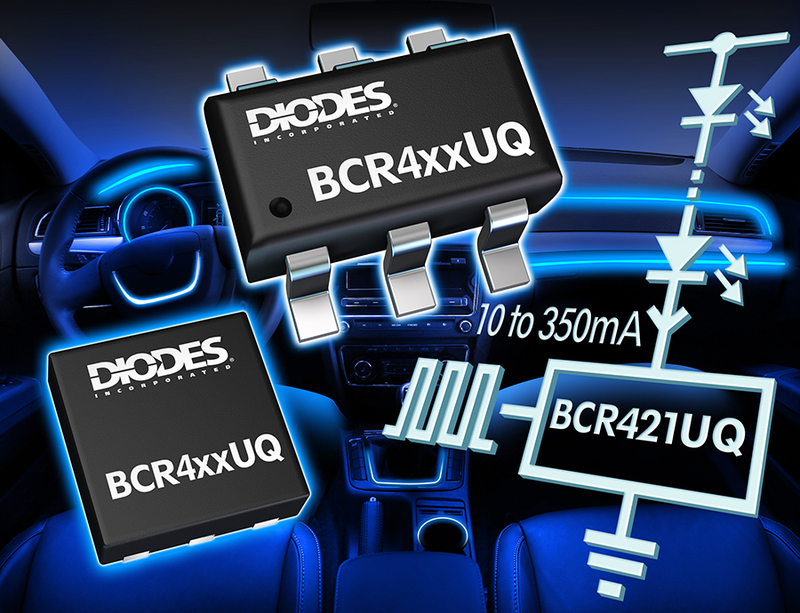 All members in the automotive-qualified BCR4xxUQ series of linear constant current regulators for LED lighting are available in production volumes now, priced at 0.11 USD each in 3k piece quantities.